Colorado's First Aerial Adventure Course! Harness the Challenge in a huge playground overlooking the Arkansas River at the entrance of Browns Canyon National Monument! 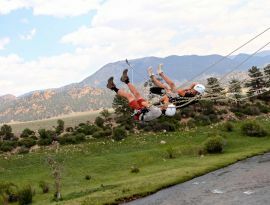 With ziplines, high rope bridges, a giant swing and much more, the Browns Canyon Adventure Park is the perfect addition to your Colorado vacation! 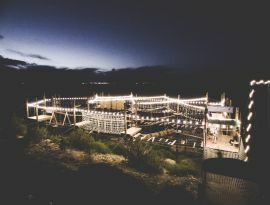 You can experience the thrill right here in Colorado at Noah's Ark. The entire park overlooks Browns Canyon National Monument. The Park offers 4 Courses and 2 High Adrenaline Challenges, including 66 unique obstacles and 7 ziplines! Courses range from introductory level elements to "blue" and "black" features designed to test the most intrepid adventurer. You can pick the level of challenge that is perfect for you. Or choose a package that includes the Adventure Park and save! 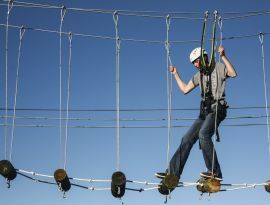 Start your day with 2.5 hours of fun on the most innovative challenge course in Colorado. Take a break from the action and enjoy a delicious lunch followed by an afternoon of rafting through Browns Canyon National Monument. 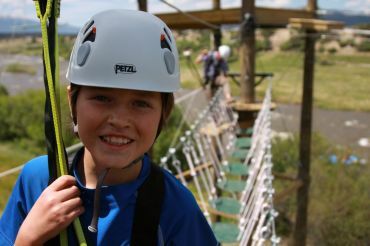 Start your day with 2.5 hours of fun on the Browns Canyon Adventure Park. Follow up the action with some quality food at our property before driving up to beautiful Mt. Princeton Hot Springs Resort for an afternoon soak. Lunch is provided.